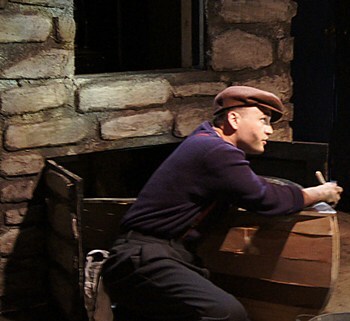 The last time Martin McDonagh’s brutally funny play “The Cripple of Inishmaan” came to Chicago, it was in March 2011 at the spacious main stage of the Chicago Shakespeare Theater. Now it’s Redtwist Theatre’s turn, in their claustrophobic little space in the Bryn Mawr Historic District, which turns out to be equally fine for the purpose, but in a different way. This time we’re right inside the rustic walls of the little Inishmaan store that’s inhabited by the stubborn aunties of Cripple Billy. Director Kimberly Senior brings us face to face with these nosy pessimists and all the other colorful characters in this tight-knit and ready-fisted community. They seem rugged and plenty quirky, but entirely human. It’s as if we’re getting a chance to know them a few decades before the story-tellers spun them larger into legend. Given McDonagh’s savage humor, his delight in shock and his tolerance for pouring buckets of blood over intimate moments — his film “In Bruges” is a case in point — there can be little doubt he intended the denizens of Inishmaan to be every bit as outlandish as Druid made them. Yet even McDonagh would find himself enchanted by the gentler humor and tragic grace of the story as it plays out in this winning Chicago production. Cripple Billy, the play’s title character, was for Druid a boy with withered extremities and pathetically twisted looks so alarming his aunties feared he’d never marry. At Redtwist, Billy is played by the strapping Josh Salt, whose flaws seem fairly minor given the over-protective worries of his aunties (portrayed with dotty charm by Debra Rodkin and Jan Ellen Graves). A subplot that takes charming flight here is the saga of Johnnypateenmike, the island newscaster and gossipmonger (not necessarily in that order) and the 90-year-old Mammy he’s been plying with booze for decades in hopes of hastening her early demise. So close are we to Kathleen Ruhl as the cheerfully cooperative alcoholic that we can see her ruddy face and lip-smacking eagerness as she prepares to please her son by draining another half bottle of the stiff stuff before noon. 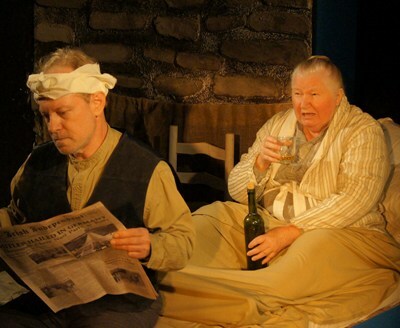 The riotous interplay between Brian Parry as the enabling son and Chuck Spencer as the horrified doctor, who’s been called to Mammy’s bedside, is a fine run of drinking jokes in the best Irish tradition. So it’s in this intimate anti-Mayberry that we learn about butchered cats and strangled geese and get some hints about the truth surrounding the death of Billy’s parents while he was yet an infant. The sea is deadly, life is hard and tenderness comes to Inishmaan rarely, as a fragile sprout that pokes through windblown turf. Billy’s oppression is real, stuck as he is in a community that pushes people into lifelong pigeon-holes before they’re out of childhood. His need to leave is underscored in many ways. 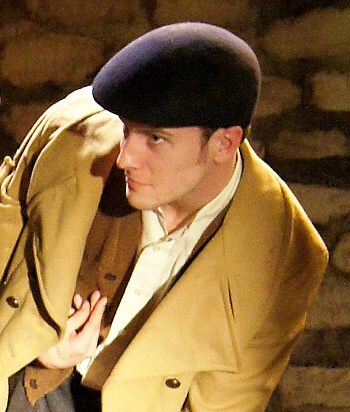 Two excellent scenes in the play are confrontations between Josh Salt’s Billy and the boatsman Babbybobby, brilliantly played by Chris Rickett as a struggling widower, taciturn without, boiling within. In their first encounter, Billy is on a mission to convince Babbybobby — however he can — to ferry him to the island where the Hollywood crew is said to be hiring. The second time, Billy will have some serious explaining to do. 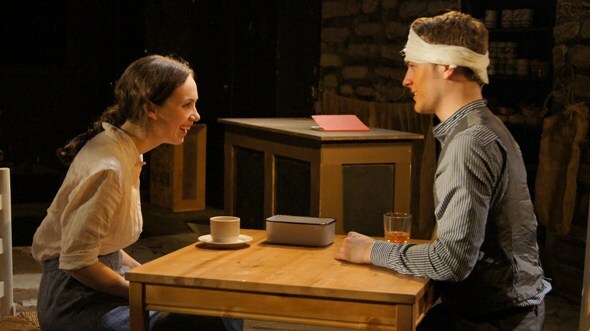 As Billy’s “filim” adventure takes its perilous twists and turns, life goes on in Inishmaan. Senior’s sure directorial hand is apparent in her attention to small town behavior, as time affords endless examination and re-examination and little of any import escapes shared scrutiny. The leisurely pace belies smart, swift scene changes in minimal space made possible by the room-transforming traps, flaps, drop-downs and chiaroscuro effects of set and lighting designer Jack Magaw. So believable is the picture created of a rustic fixation on all events big and small, that it comes as a distinct pleasure to learn certain secrets on this particular island have been well kept after all. Photo captions and credits: Home page and top: Bartley (Patrick C. Whalen) takes a slimy drubbing of raw eggs from Slippy Helen (Baize Buzan). 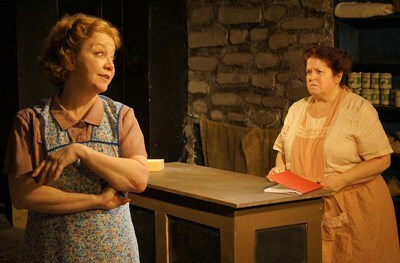 Descending: Aunties Kate (Jan Ellen Graves) and Eileen (Debra Rodkin) fret over Billy. Cripple Billy (Josh Salt) is determined to be in a Hollywood “filim.” Johnnypateenmike (Brian Parry) wants to help Mammy (Kathleen Ruhl) drink herself to death. Babbybobby (Chris Rickett) has the boat that could be Cripple Billy’s ride off the island. Below: Slippy Helen (Baize Buzan) has yet another laugh at Cripple Billy’s expense (Josh Salt). Photos by Kimberly Loughlin.